Ekaterina Sedia, over the course of only a few novels, has assembled a body of work that has continually left me in awe of her creative and daring power. Some authors use mythology to merely accentuate their worlds, while Sedia makes mythology grow and change to her whims in lyrical and poetic ways that make them feel like all her own creation. If you think you've read it all in Fantasy than think again. 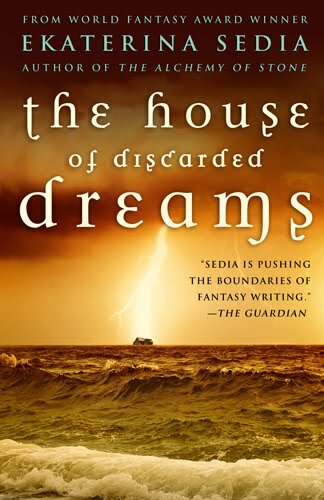 Sedia's latest The House of Discarded Dreams gathers odd mythology from around the world to create one of the most unique novels in Speculative Fiction today. Sedia shuns conventionality for a story that seemingly has no connective tissue to form something more than the sum of all its parts. It is the story of a young woman trying to find herself in a country that doesn't feel like her own. It is a modern melding of old and modern mythology and fears. It is a story of dreams and nightmares coming to life. The story centers around Vimbai, a college student and daughter of African immigrants. Vimbai is drawn to a house in the sand dunes of New Jersey as an escape from her family as she searches for who she wants to be. Sedia brings some of her own experiences as an immigrant coming to America and living in New Jersey to the fore, but lots of research shows though as well. 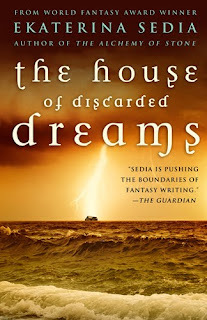 Africa has a mythology very unlike the style most Fantasy readers are use to, which makes The House of Discard Dreams a very impactful and original read. Vimbai moves in with two other people who are given sketchy backgrounds, at best, one of which, Felix, has some sort of black hole in place of his hair and the other, Maya, a bartender in Atlantic City, who is the epitome of distant for much of the novel. Soon after moving in the house begins to change and odd things start to appear along the lines of ghosts, Psychic Energy Babies, and talking crabs and fish all of which barely scratches the surface of the complete and utter strangeness of it all. Even amid all the originality there are some downside issues. The characters come off as distant and unknowable for too much of the story. What drives the other roommates? Maya's dark closet eventually comes out after much cajoling, but Felix comes off more as window dressing and often gets lost in the background. Sedia also missed an important scene near the beginning where Vimbai tells her parents that she is moving out as she goes from looking at the house to a couple weeks later living there. And I wasn't completely satisfied with the explanation on the black hole hair-do or how easily everyone accepts the changes in the house. As the novel closes a good sense of growth is felt for Vimbai as she discovered the confidence and strength she was always looking for. It is an emotional journey that will leave you perfectly satisfied. All you fans of Charles De Lint take notice. You've got a new favorite author and their name is Ekaterina Sedia. I give The House of Discarded Dreams 8 out of 10 hats. I can't wait to see how Sedia surprises me next and with Heart of Iron coming later this year it won't be too long. Sounds like an odd one. Good thing that's the way I like'em. I've only read Secret History of Moscow, but quite liked it. I have Alchemy of Stone on my wish list, but it sounds like this one needs to be on there too. Nice review.